We acquired a rusty iron plant stand years, and years ago. It is one of the few pieces that has followed us about from home, to home. She's has been reinvented more times than I can count; as a sofa table with a slab of wood affixed to her top; space to organize diapers, wipes and onesies in the nursery; an herb stand; outdoors, indoors - an ever changing staple in our home. As an adopted family member, she's wandered about with us. Though the cottage has caused an exodus of furniture, she remains, still. 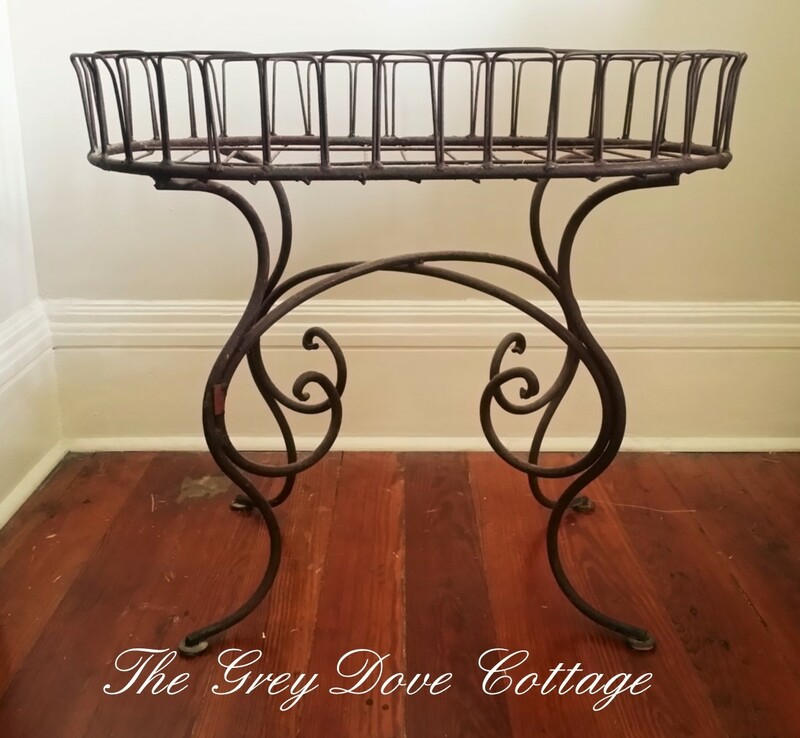 Small in stature; 30" wide and only 19" deep she fits a lot of spaces. Graceful curving legs, an "X" stretcher, and small brackets shooting up from the frame, create an intricate gallery define her. A bit rusty, a bit architectural, she's a classic. 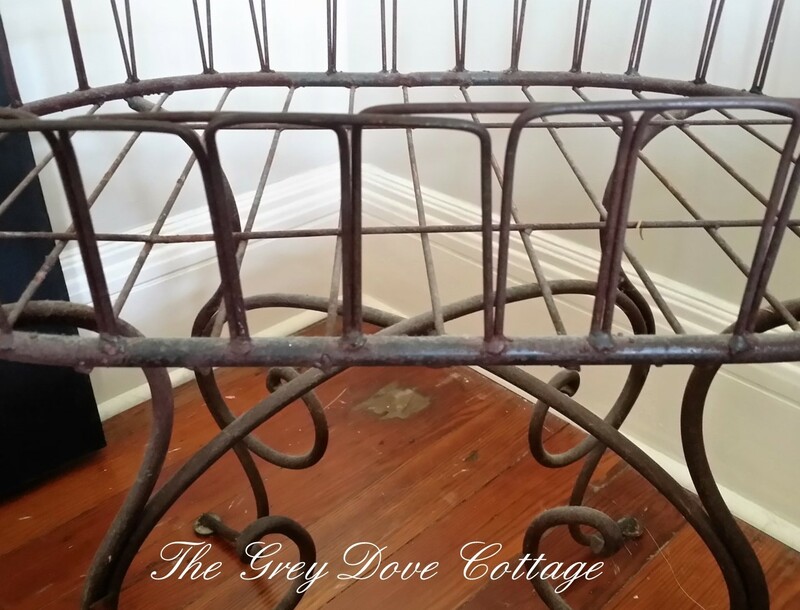 This little rusty, scrollwork, iron plant stand has won an important role; She'll be repurposed to serve as my bedside table. She'll showcase some of my favorite things; blue and white boxes gifted to me by Jr., photos, a string of pearls gifted by a dear friend who fetched them for me while in Asia. Our master style is French, layered with antiques, a bit formal, then a bit rustic, and industrial. The small space allotted for my side table was a challenge, the door swings to my side of the bed, having something rectangular wasn't desirable. This old friend, fits my needs; oval, petite, and brimming with style - now to give her a top. We had some bits of wood in the work room, a combination of 2" X 4", and a 2" X 6" which was cut with angles on either end. 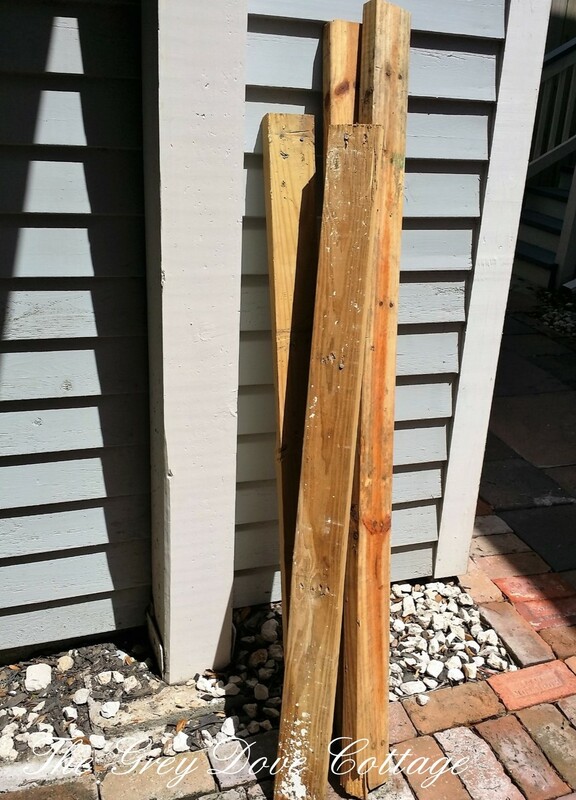 Interestingly enough the remnant "2 X 6", was exactly what I needed for inspiration, it would be affixed as the front on the table top. 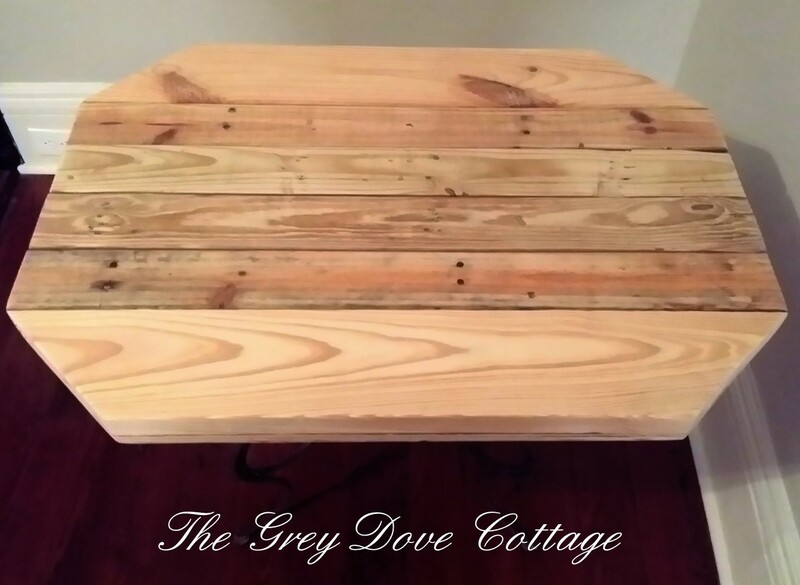 The center of the table top would be a set of the four "2 X 4", then finish off the back with a twin to the remnant. With this design a sort of rough, angular, oval shape would take form and outfit the iron plant stand well. 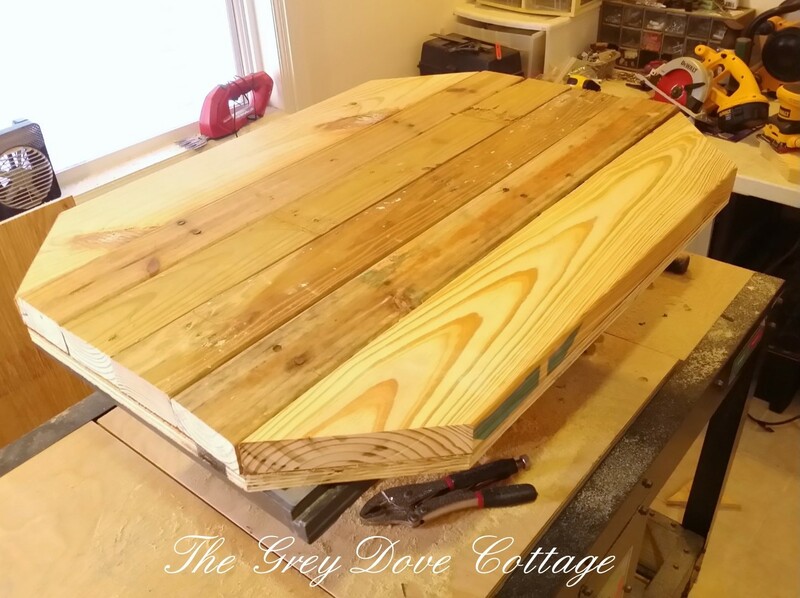 I cut the backs of the nails protruding from through the backside of the boards, leaving the heads in place. Not wanting to hide the beautiful gallery of the plant stand, we chose to allow a 3" overhang all the way around, and affix boards to a plywood base in an effort to add a bit of height. Mr. GDC, measured and cut a 3/4" piece of plywood with 3" overhang on each side. 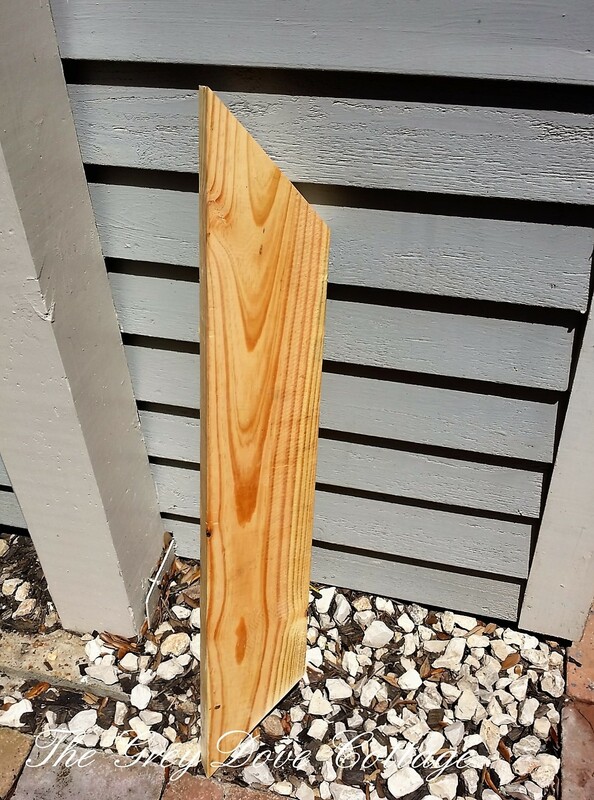 The side boards (2"X6") were cut to length, we used 36". He created a twin to the 2" X 6" remnant. 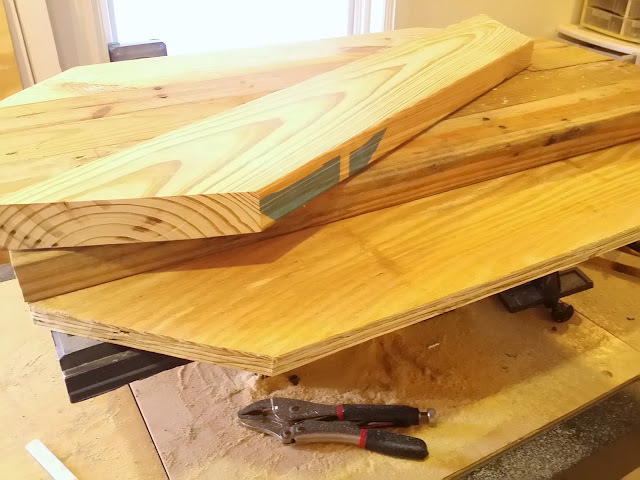 Next; the four middle boards (2" X 4") were cut to length, 36". We laid the boards out on top of the plywood base with the nail heads on top, then used adhesive to affix the boards to the plywood base. 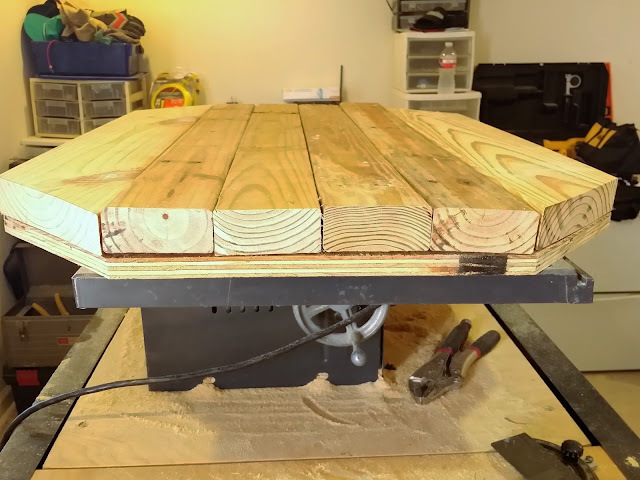 We mounted the boards to the plywood using wood screws; affixing the boards from the bottom through the plywood base toward the top so the screws are underneath the table top. 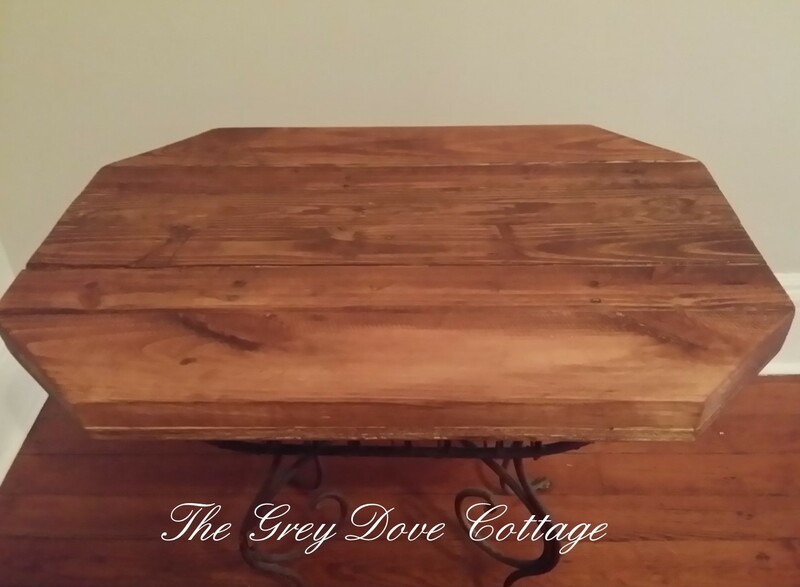 Once the top was made, Mr. GDC sanded the edges with an electric sander to create a smooth edge all the way around the table. To attach to the top to the base we chose metal wire clips, found in our local big box hardware store. We placed the top on the floor wrong side up, set the plant stand top to top, centering it. We mounted the top to the stand by catching the iron work in the clips, then screwing the clips to the wood top. Once her top was affixed, I covered the planks with Minwax Pre-Stain conditioner. it is important when working with raw wood to apply a conditioner prior to stain. 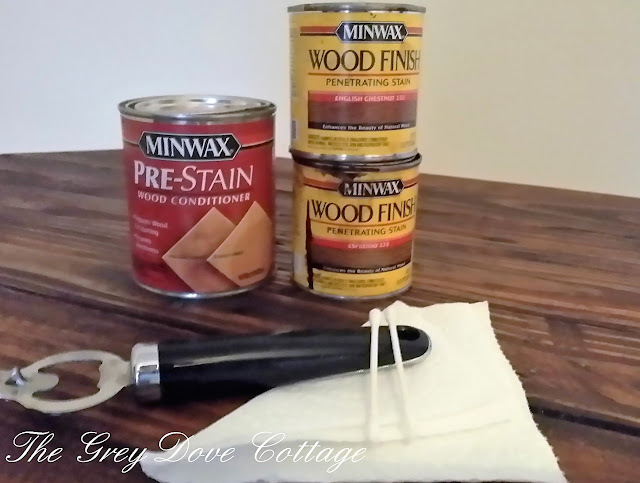 The conditioner will help to insure an even coat of stain. 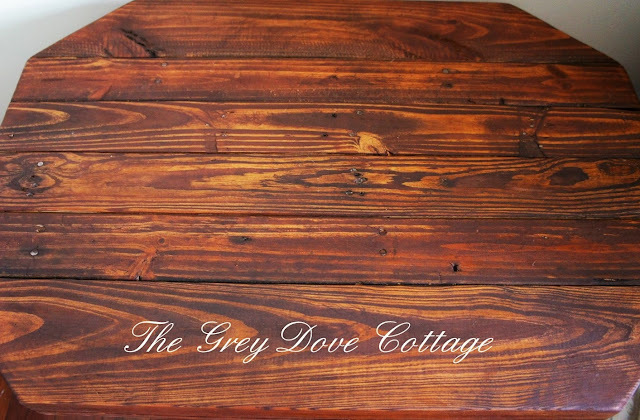 Raw wood can sometimes act as a sponge, soaking up stain, creating a darker finish than intended. 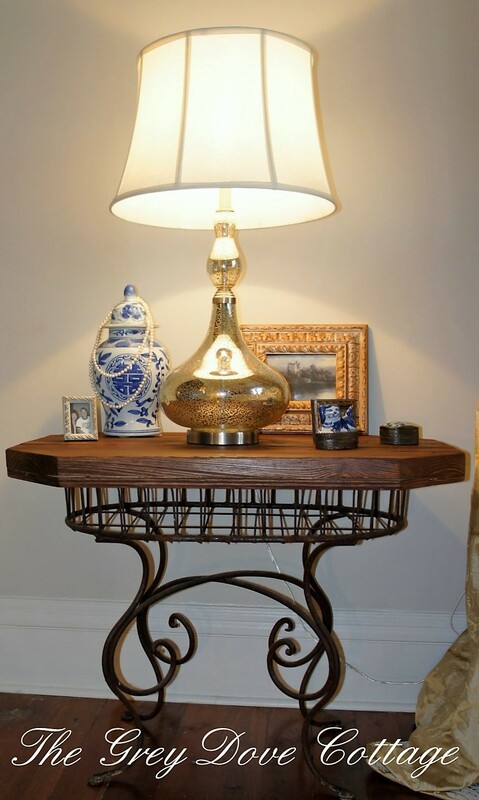 The table is being added to a room of French antiques; the antique pieces have patina. 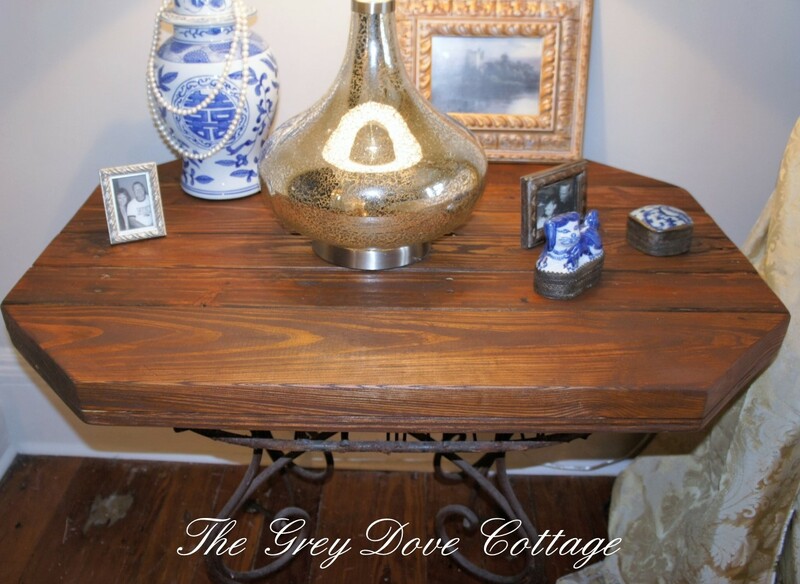 In an effort to create a piece that has a faux antique patina, I chose to layer the stain. For this project I used paper towels, because they absorb the stain better than cloth, and tend not to release stain back onto the wood. Cotton swabs are a good tool to push stain inside crevices, and imperfections. 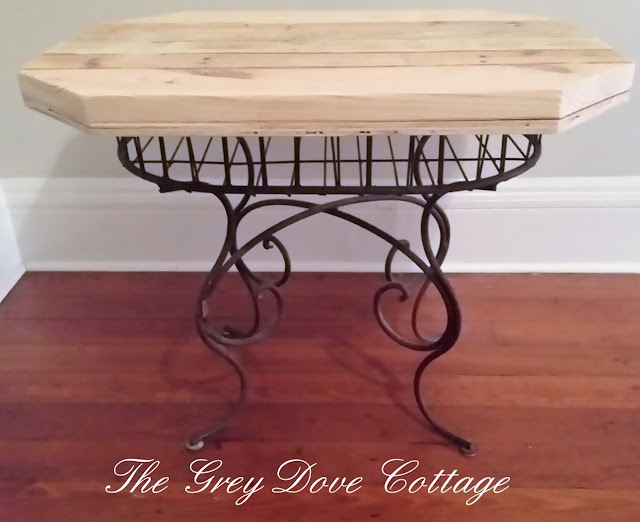 When using salvaged wood, the surface is not smooth. 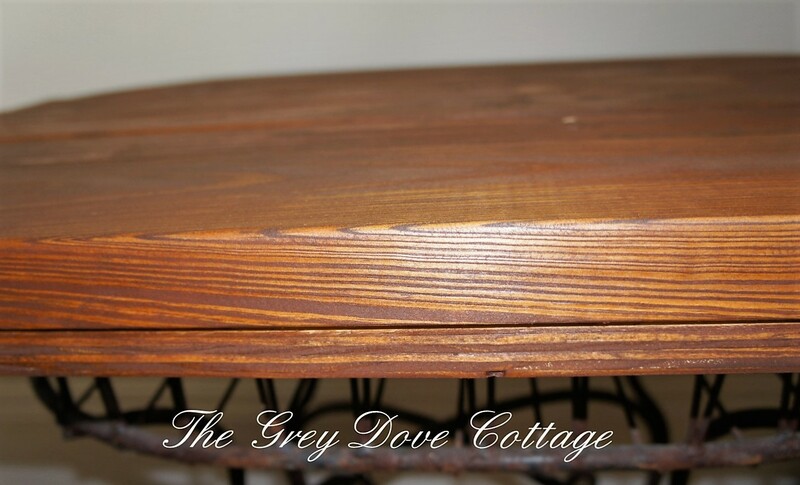 I enjoy applying the darkest stain within the crevices and imperfections to create depth in my furniture, adding that faux layer of age. I began with a layer of Minwax English Chestnut Stain and Seal. 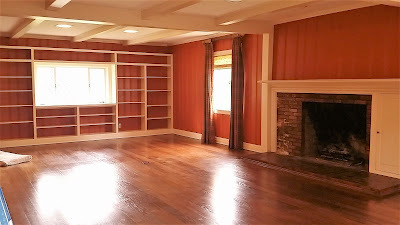 When layering stain it is important to begin with a lighter color tone, depth can be built up. Beginning with a darker tone, can leave you with a piece darker than you intended, causing you to have to strip, and sand the color off. 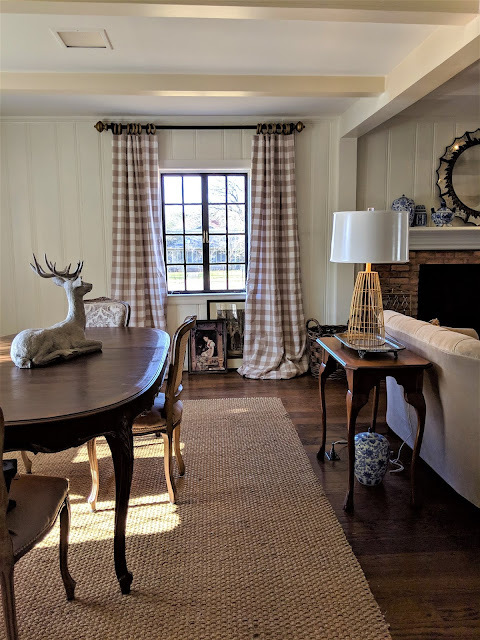 Once the layer of chestnut was even, I went over the top with Minwax Espresso Stain and Seal, to enrich the color, making certain that the espresso laid into the imperfections of the wood. I finished off the top with another layer of Chestnut. The final result; a unique and interesting addition to the master bedroom. The piece lives well in the master among the French antiques. 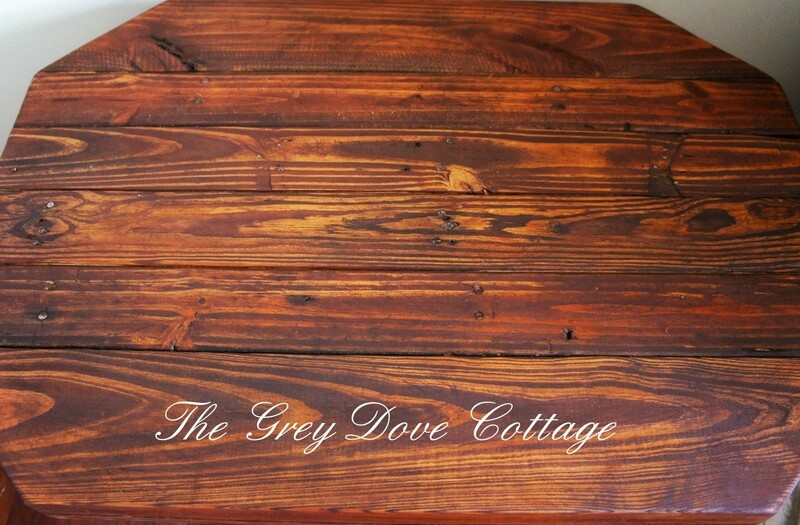 Though in reality the top is new, made of salvage, the finish helps to create the illusion of age. 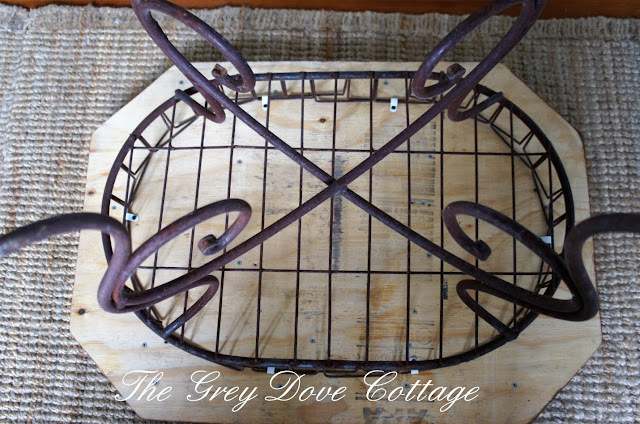 The rusty plant stand provides graceful interest and texture to the room. Holding a shiny new mercury lamp with a contemporary line, the small blue and white porcelains boxes, and showcasing a ginger jar with the pearls draped over it's lid, the finished look is layered, and gathered - French. Love it! Looks perfect! Love the pearls and the girl who wears them!